I am so pleased with this set of beautiful Cain Manor wedding photos from my latest Cain Manor wedding. It is partly through my efforts (finally got used to my new camera) but in the most thanks to the much lovelier professional shots kindly supplied by Guy Collier Photography. My Cain Manor wedding photos selection is now right up to date thanks to Guy. 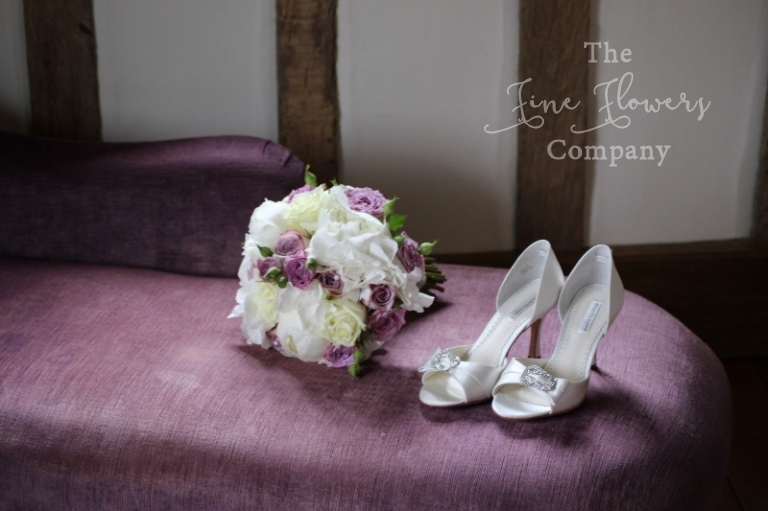 Cain Manor is a lovely venue, and fickleness of satnavs aside, it is a pleasure to return to this gorgeous Hampshire venue, so soon after our last wedding here – for those Cain Manor wedding photos please click here. On this ocassion I am returning here for Carolyn and Mark’s wedding flowers. 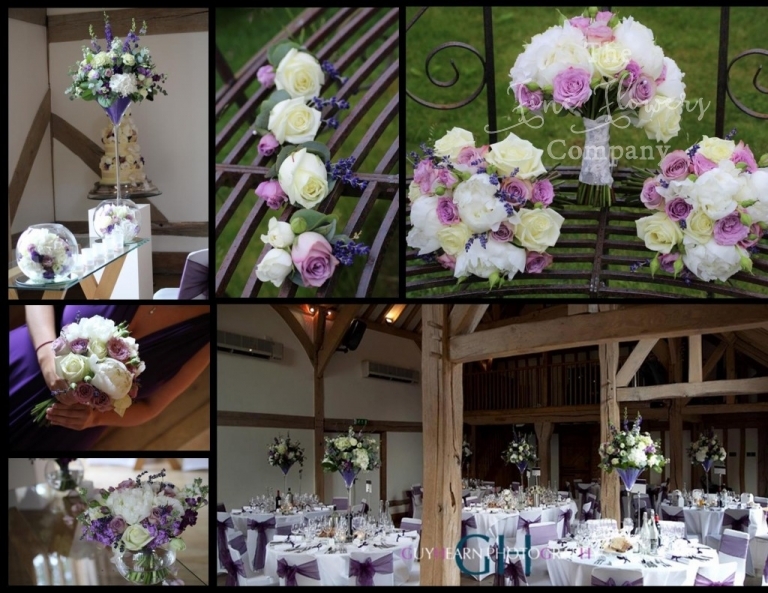 Carolyn chose a stunning, really rich plum-purple colour scheme for her bridesmaids dresses and venue accents, and loved blousy textural flowers like paeonies and hydrangeas, so these were featured throughout. 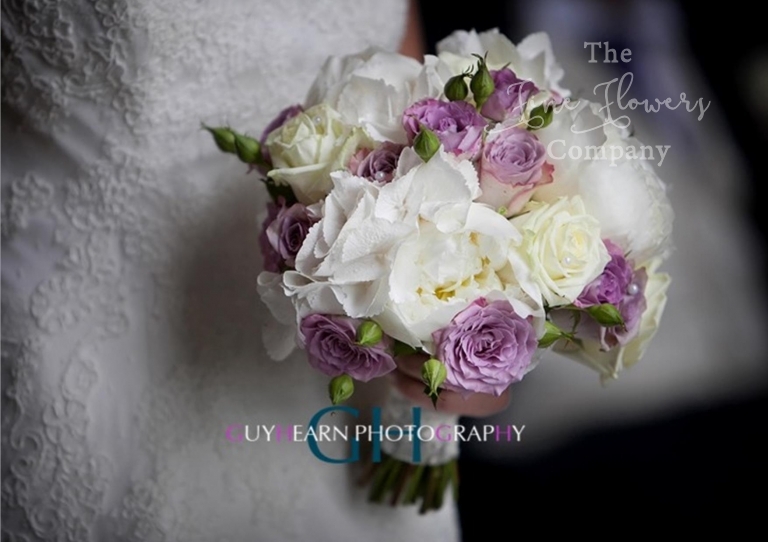 For her bouquet, Carolyn opted for a bloomy bouquet of hydrangea, roses, paeonies and lilac roses and spray roses. This had a lovely texture which beautifully complemented her lace dress. For the bridesmaids bouquets, we recreated the same effect but added deep purple lavender which perfectly matched the colour of their dresses. For the ceremony, we flanked the ceremony table with 2 tall martini vase centrepieces, and dressed the table with pretty fish bowl vases tightly packed with textural hydrangeas, roses, lisianthus. The assisstant registrar’s table was similarly styled with vase centrepieces at both ends. To finish off this very pretty look, we dressed the aisle with scented rose petal scatter. For the wedding reception, the guest tables were dressed with Martini vases, while the top table reused the low vase centrepieces used previously on the register tables. And finally the beautiful cake was dressed with very pretty blooms. I had to use all my willpower to be so close to chocolate without heading straight out to a Thorntons. It’s just as well that the venue feels so secluded, I may otherwise have weakened and given in. It was a pleasure to bump into Guy from Guy Hearn Photography. He is a great photographer and captured some beautiful shots from this wedding, some of which I have included below as a little taster. 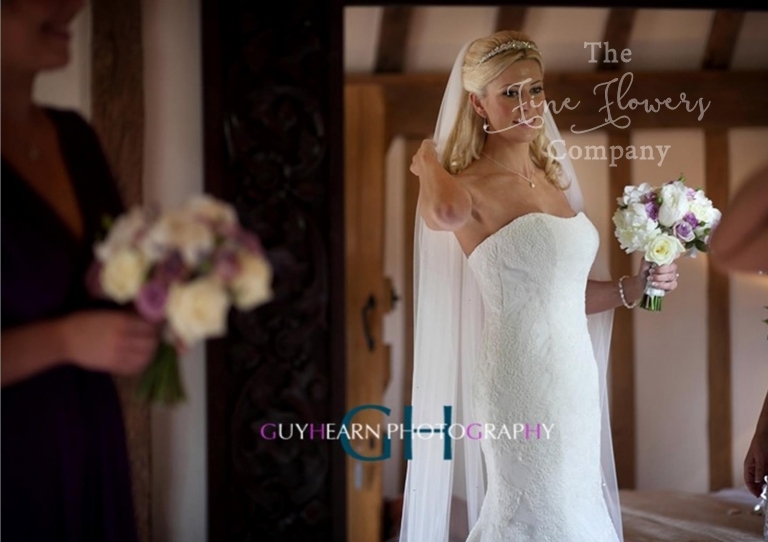 For more inspiring Cain Manor photos and wedding photography, please visit Guy’s website. In the meantime, here are more photos from this lovely wedding.